This is the next installment of my chapter-by-chapter review of Rev. 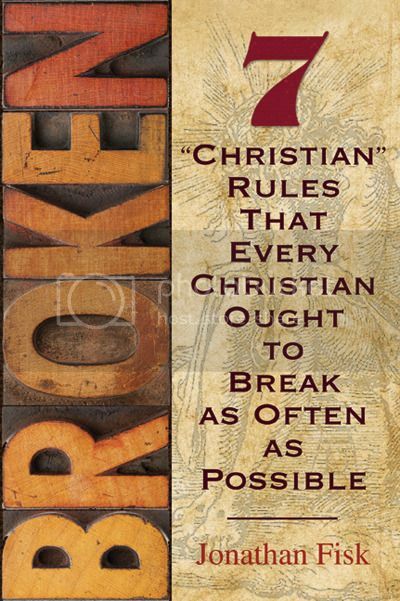 Jonathan Fisk's Broken: 7 "Christian" Rules That Every Christian Ought To Break As Often As Possible so if you missed the introductory piece, then please start there, and then follow that up with the other pieces previously published in this series. It's been interesting for me to go back and reread one of the first distinctly Lutheran pieces of writing that I had ever put my hands on (even before getting my own copy of the Book of Concord and Small/Large Catechism) back when I fully embraced becoming a Confessional Lutheran. To this point in this series, I've only reread the Introduction and Chapter 1, but I've fallen in love with this book all over again! As a result, I think the first two entries in this series were a little too lengthy for our purposes here so I'll be taking a slightly different approach this time around. However, before we get to our next Chapter Review, let's quickly review Pastor Fisk's purpose in writing this book. "In this book, I will dissect this tactic of the thief. We will look at how the devil uses such good gifts from God as your heart, your mind, and your hands to try to trick you into placing your trust not in God but in yourself. We will explore the seven counterfeit 'Christian' rules he tries to play off as if they were authentic Christianity. We will expose these rules as patterns of thinking that try to break your faith in Christianity by creating doubt. We will call these philosophical systems what they are: lies. And then we will challenge those lies with the truth given to us by our Lord Jesus Christ. The crow comes cawing, promising you freedom, but telling you that YOU mus earn it. He promises you suprnatural wisdom, but tells you that YOU must figure it out. He promises you comfort, but insists that YOU find it inside yourself. He tells you that you're just on the other side of glory, if only YOU can create it. He offers you the world, but he leaves you hanging on a cross all by yourself, fed up with it all and wondering in anger and frustration where Jesus is. He was supposed to make it all better. He does this the only way he can: he steals Jesus' words, and he uses YOU to do it. I am not going to let that happen." Like I said once before, that's quite refreshing. Ok, but what about Chapter 2? What is the next lie that Satan uses against us so often? "Never #2: Never follow a rule that wasn't written in stone a very, very long time ago (doubly so if the grass is only greener on the other side because it's made of plastic)." So Chapter 2 introduces us to the second rule that every Christian ought to break as often as possible -- Moralism, or the incorrect belief that access to God can be achieved through your personal efforts or attempts to improve yourself. In short, Moralism is nothing more than the worship of your works. While Mysticism seems to be most prevalent throughout Christ's Church these days, I personally think that Moralism isn't that far behind her (do a quick Google search for "Moralistic Therapeutic Deism" and you'll see what I mean). I will also share that, for me, Moralism is also the one "Never" that I seem to struggle with the most in my life. Why? How so? The "good" mentioned here are the self-imposed "rules" that we think will justify us and makes us better in God's eyes. As the Study Guide pointed out, it's one thing to follow a rule because it's good, but it's another thing entirely to believe that "I am good" because I follow a rule, much more so "because I follow a rule better than you do." See the problem? I'm sure this is a problem we all struggle with too, but I can assure you that this is the struggle that keeps popping up in my life despite what I presently believe, teach, and confess. I could blame it on the fact that I've always been a bit of a perfectionist and a people-pleaser, but it's really because I'm a self-righteous sinner. Raised in a climate and culture that preached "Never Give Up!" and "You Can Be And Do Anything You Want To In This Life!" while being praised and rewarded repeatedly for my "good behavior" all the time, I guess it's no surprise that Moralism would be the one rule that I have to fight to break as often as possible. I don't want to ruin anything for you if you haven't read this book yet, but there's a phenomenal section that discusses "lowering the bar" and using a "sliding scale" all the time where your life is constantly operating in a day-to-day system where you personally measure your own "godliness" not based on what Christ has done and continues to do for you, but based on "Me, Myself, And I" and your own perceived "good works" done in His name. "Morality is a good thing, a knowledge of the truths created by God to make the world work efficiently and in harmony. But Moralism does not want you to worship God and believe in God's morality. He wants you to worship you. Step 1 is teaching you to trust in morality as the path to finding God's blessings. Step 2 is teaching you to place that morality on your own personal SLIDING SCALE. Whether it is the Ten Commandments written in stone or your New Year's resolution to eat right, lose weight, or read more books, the moral doesn't matter. The rules you follow can be your own opinions or an eternal truth. What matters is your belief that by following those rules you will alter the course of your life or the universe or both. What matters is that when you find you can't follow those rules perfectly, you find a way to make it look like you did. In this way, Moralism does not tempt you to believe in good things and do those good things for other people. He tempts you to do good things for YOURSELF. The goal is to be good so that you can look at yourself and say, 'Hey, check it out. I'm doin' pretty good.' So when you fail just a little, you change the definition of 'good' just a little to convince yourself that you are succeeding in making the world a better place. The more you bend the 'good' to fit yourself in it, the more you believe you actually HAVE been a good person. You convince yourself you really HAVE done the right thing most of the time. You buy your own illusion that you really are making the world a better place. But the more this happens, the more you also begin thinking everyone else isn't quite living up to their end of the bargain. When you look around, you start to get frustrated that no one else can measure up to the new, mostly good measure of all things: YOU. Having come to the conviction that you are (at least) mostly pleasing God by the actions of your hands, what you can't see is how far you adjusted the meter, how much you nudged the results, how greatly you changed the final score to appear in your favor." You will know if you're being seduced by Moralism when he whispers things like, "Shift the blame," and, "It's the fault of everyone else," and "You've only done your best," and "You meant well so give yourself a pat on the back." Two years ago, this is what I wrote in the margin about this part: "Wow! I've just been smashed in the head with a Sledgehammer of Truth!" -- and that's just from the first few pages of the chapter too! As revealing as that was for me, it was only a few pages and paragraphs later when I was blindsided with more truth about how I had been believing Moralism's lie for far too long as evidenced by a severe "guilt complex" that forever plagued my conscience ("Guilt is the firstborn son of Moralism" p 59). I also like how Pastor Fisk explains how the "Nevers" (a.k.a. the lies that Satan uses against us) work together and collaborate to come up with the most effective way to deceive us and lead us away from God and the truth. The real spiritual danger, which Pastor Fisk clearly exposes? "Moralism's promise, 'Do this and you will live,' is never done. The need for law and order is written on every human heart, yet the work of our hands cannot make redemption possible." (p. 60). This is precisely where a "Works-Righteousness Theology" comes from too. With that in mind, I'll end with a word of caution even though there's really so much more I could write for you about this chapter. We're told that, "If you currently attend a church where the emphasis is on you and all you can do to make your life and your world a better place, don't be fooled" (p. 63) and that's why the chapter ends with some important reminders for believers and Christian churches to be on guard against this type of preaching and teaching. In a Lutheran layman's terms, please stick around for more on this exceptional Christian book; a book that you need to add to your own personal library right away if you haven't already. Why Do Christians Easily Believe False Teachers? Homosexuality: The Silence Of Jesus?